Gangaraju and Kavitha had no support from their families after their marriage. 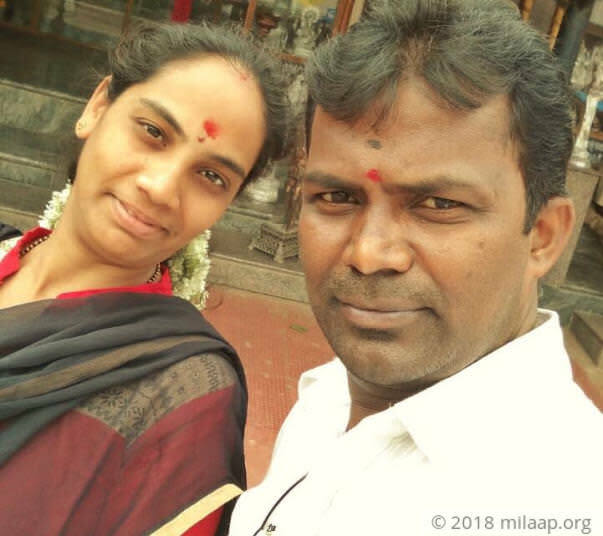 But they have looked up to each other and started a new life together, Gangaraju worked as an electrician and Kavitha as a nurse in a private hospital. They were blessed with two beautiful children. Despite their poverty, they have lived a happy life. 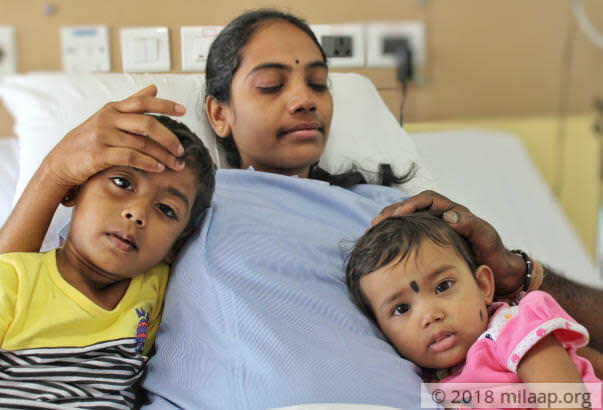 But their happiness did not last long as Kavitha started to fall sick frequently and soon she found herself fighting for her life with cancer. "My wife has always been very active and full of energy. She took care of the children and was regular to her work. But now she is not able to even walk. She has been throwing up daily for past 9 months. At times, she is too weak to even stand so I carry her to the washroom. Every day she makes sure that our children are fast asleep only to weep without making a sound and let out the heavy burden from her heart.” - Gangaraju. A few months ago Kavitha had severe stomach pain and threw up frequently. Despite visiting many hospitals, they were unable to identify the problem. 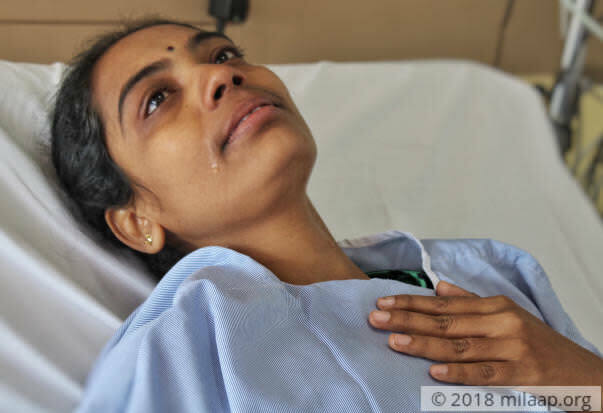 When they reached out to a private hospital in Bengaluru they were told that a cancerous tumor is growing in her stomach and it is quickly growing. "When they told us that tumor will kill her if it is not removed, we panicked and felt completely lost. We immediately started the treatment. We exhausted all our savings to remove the tumor. We were warned that it might grow again if proper treatment is not taken, but we were left with nothing to go for such expensive medication. So we opted for ayurveda, but she soon developed a cancerous tumor again.” - Gangaraju. This 29-year-old mother is suffering from Adenocarcinoma stage IV, a form of stomach cancer that starts in the glands and spreads to other parts of the body. 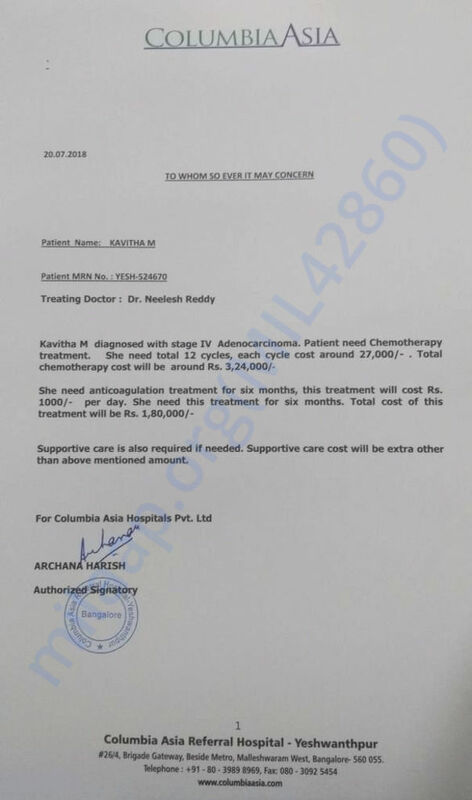 Kavitha needs 12 cycles of chemotherapy and 6 months of anticoagulation treatment which will help prevent blood clots. Without these urgent treatments, cancer will rapidly spread and kill her any moment. “Any delay will only worsen her condition so I managed to begin the treatment, but it has affected the blood circulation on her right shoulder, and she constantly suffers from severe shoulder pain. My wife needs 2 injections a day for proper blood circulation. At times, the pain is so uncontrollable that she doesn’t even allow us to touch her. And all I can do is to helplessly watch her go through the suffering, it is distressing to watch her in so much pain.” - Gangaraju. Gangaraju is an electrician who earns Rs 400 a day and Kavitha was a nurse in a hospital. Now Gangaraju is the sole breadwinner of the family as Kavitha is no longer in a position to work. They have spent 5 lakhs until now on the treatment and have exhausted all their savings. This husband is left with nothing to save his loving wife. "We have spent everything we had to remove the tumor and now we borrowed a huge sum of amount and started the treatment. I have done everything that I could but it has become impossible to continue the medication. Two injections cost Rs1500 a day, which is beyond my means. My wife is everything to my children and me and she is counting days, I feel dreadful at the thought of losing her. Please help me save my wife, my children and I cannot imagine a life without her.” - Gangaraju. 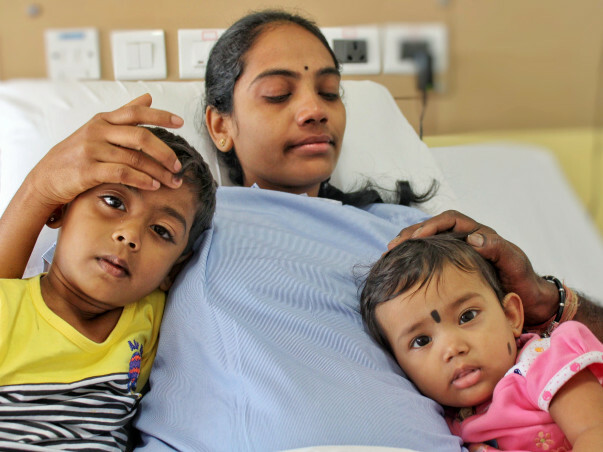 29-year-old Kavitha is a mother of two children and is suffering from a severe form of cancer. Without urgent chemotherapy and anticoagulation treatment, she will never be able to make it. Husband is lost in every way to continue the medication which can save her from certain death. 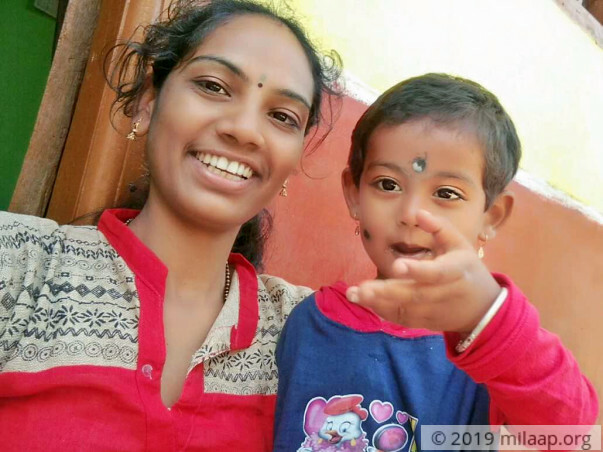 The family needs 5 lakhs and is completely dependent on the crowdfunding to save Kavitha’s life. Kavitha has undergone 11 cycles of Chemotherapy. Last 3 Chemotherapy were not successful as the cancer cells are not reducing. Further treatment plans will be decided by the Doctors in the coming days. Here's a quick updtate on Kavitha's health. Kavitha is responding to the treatment and is doing good. She is recovering slowly and will be undergoing her 6th chemotherapy cycle this week. Thank you once again for all your support. We shall keep you posted. Please keep praying for her speedy recovery. Kavita is doing good now. She is undergoing her 6th cycle of chemotherapy. The doctors have called her for a blood check up this week. She is on medication as well. We are hoping for her speedy recovery! This would not have been possible without you. Thank you all for your love and support.